Anaerobic digestion is the natural biological process which stabilizes organic waste in the absence of air and transforms it into biofertilizer and biogas. It is a reliable technology for the treatment of wet, organic waste. Organic waste from various sources is biochemically degraded in highly controlled, oxygen-free conditions circumstances resulting in the production of biogas which can be used to produce both electricity and heat. Anaerobic digestion is particularly suited to wet organic material and is commonly used for treating animal manure, organic fraction of MSW, sewage and industrial effluents. Anaerobic digestion is a unique treatment solution for organic wastes as it can deliver positive benefits related to multiple issues, including renewable energy, water pollution, and air emissions. Anaerobic digestion of organic wastes is fast gaining popularity as a means to protect the environment and to recycle biodegradable materials efficiently. Many industries produce liquid and solid wastes that are suitable for anaerobic digestion, such as food processing, pharmaceuticals, organic chemicals, paper manufacturing and tannery industries. Some of the wastes might be difficult to digest as a sole substrate, but they can be biochemically degraded in combination with manure or sewage sludge. The combined digestion of different wastes is called co-digestion. There is a large untapped potential for biogas generation in the Middle East which is mainly contributed by municipal solid wastes, sewage, industrial wastes and farm wastes. MSW is the best feedstock because of high organic content in solid wastes in Middle Eastern countries. On an average, more than 50 percent of the municipal waste stream is constituted by biodegradable fraction. Huge quantity of sewage sludge is produced on daily basis across the region which presents a serious problem due to its high treatment costs and risk to environment and human health. On an average, the rate of wastewater generation is 80-200 litres per person each day. 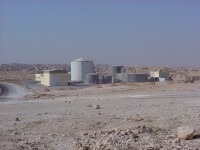 The handling of sewage sludge is one of the most significant challenges for municipal authorities in the Middle East. Anaerobic digestion is among the best methods for management of municipal wastewater worldwide. The Middle Eastern region has strong animal population. The livestock sector, in particular sheep, goats and camels, plays an important role in the national economy of the Middle East countries. Many millions of live ruminants are imported into the Middle Eastern countries each year from around the world. The most attractive method of converting animal wastes into useful form is anaerobic digestion which gives biogas that can be used as a fuel for internal combustion engines, to generate electricity from small gas turbines, burnt directly for cooking, or for space and water heating. The food processing industry in Middle East produces a large number of organic residues and by-products that can be used as biomass energy sources. In recent decades, the fast-growing food and beverage processing industry has remarkably increased in importance in major countries of the Middle East. The mushrooming of hotels, restaurants, fast-food joints and cafeterias in the Middle East region has resulted in the generation of huge quantities of food wastes. The relevance of biogas technology lies in the fact that it makes the best possible utilization of industrial organic waste as a renewable source of clean energy. Diversion of industrial waste from landfill sites and taking it to plants which can turn it into biogas and biofertilizer will ensure that it is treated in such a way that it becomes a useful product instead of a harmful one. Tagged Anaerobic digestion, Anaerobic Digestion in the Middle East, animal manure, Bioenergy, Biogas, Biogas Feedstock, Biogas in the Middle East, Biogas Potential in the Middle East, Food Waste, Industrial Wastes, MENA, Middle East, MSW, Organic Waste, sewage. Bookmark the permalink. i m interested in working in this domain would like to folowu. Absolutely correct that there are many economic and environmental benefits what regards biogas product from farm and household waste in the NENA region especially in the less favored countries in the region. National management and structured policies need to developed to safeguard natural resources in particular the protection of land-water resources. Another option is a national strategy to involve and engage the population in small and organised projects. It applaud this article as it makes the case very well for the increased use of Anaerobic Digestion in the middle east. However, unless there are financial incentives for the developers and owners of these plants from their governments I find it hard to imagine how many AD plants can be financed due to the high initial construction cost which takes many years to win back. States which have their own large oil reserves are probably unlikely to want to fund the renewable energy from biogas as a competitor to the countries own oil products. I hope that I am wrong, but it was a thought that occurred to me as I read this article. i have dream that biocompost from biodigester would be make green on the dessert.